Sarah is a loyal Audi A4 owner, who maintains her car by the book. When something needs to be done, she has it done right away. Usually at the dealership, and always with genuine Audi parts. It is immaculate. You can eat off the seats of her car. Rain doesn't just bead up when it falls on her car, it seems to pause and admire the car before it hits it. I often wondered how she got that way. Now I know. She learned it from her dad. I never met her dad. He passed away four years ago. I heard a lot about him, though. He was a Marine. He was a special-ed teacher, who was loved by his students and their parents. He was an artist who painted and drew. He was an incredible woodworker. Towards the end of his life, he created brilliant sculptures with rebar, a forge, an anvil and a MIG welder. And, except for not teaching her to appreciate old, rusty, French, English or Italian cars, he did a pretty good job at raising Sarah. When Sarah's dad passed away, she and her mom decided to keep his truck. It was his pride and joy. For the most part, it stayed locked in the garage of Sarah's mom house. Every now and then Sarah would use it to pick up something for her house, or help a friend move something, Sarah, being Sarah, made sure she or her mom took it in for regular service. Earlier this year, Sarah's mom took it to the Ford dealer for service and was told it would need exhaust work soon. The old exhaust would most likely still be fine, but she had it replaced that week. A few months ago, Sarah's mom decided it was time to sell her house and move into someplace a little smaller. She found a very nice condo near Sarah and not too far from where she lives now. It was the perfect place, except for one thing; it has just a one car garage. The decision was made to sell the truck. Sarah called me a couple of weeks ago and asked if I would help her and her mom sell the truck. Of course I would. Sarah told me that her mom had all the records for the truck, going back to when it was new. Did she ever. 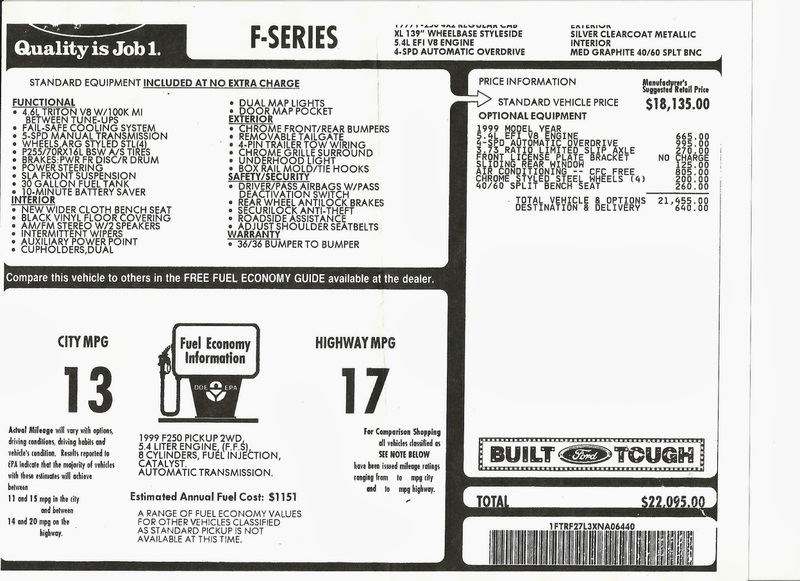 Everything, including the original window sticker and a book chronicling fill ups and gas mileage filled a cardboard binder. Every report from every state inspection is included. The spare keys and all the original brochures are there. When she said "everything," she meant everything. This might be the nicest 1999 Ford F250 you will ever find. There is virtually nothing wrong with it. It has just 56,000 well documented miles on it. There is a 4" scratch on the top left of the bed. It was too small to photograph properly. There are a few scratches in the bed floor. They're from a plywood bed Sarah's dad made to prevent bigger scratches. It has a nice vinyl bed cover. The wheels are perfect. The interior looks like new. The V8 has more than enough power. Everything is original and stock, including the radio. Sarah and her mom are not giving this truck away. 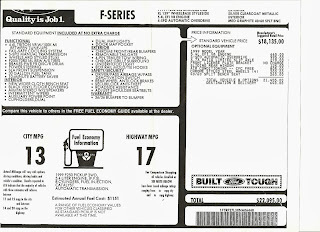 You can find cheaper 1999 F250s. I know that. However, if you're looking for one in near-new shape, adult owned, never beaten on and with a well documented history, this one is definitely worth is checking out. "The price is steep." No doubt. Looks to be in impressive condition though. Not surprising, based on the backstory you provided. Still, $9K for a 15-year-old F-series 4x2 with an original MSRP of $22K is a big ask - even with the low miles and complete 1-owner history. GLWTS. This probably isn't the best time of year to be trying to sell a 4x2 in the Northeast, but I'm sure the right buyer is out there.